Mattie Cook has big dreams of turning her family's coffeehouse into much more, but her day to day reality involves following orders from her cross mother. 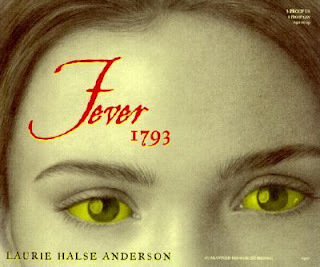 When yellow fever hits Philadelphia, and hysteria accompanies it, Mattie wants nothing more than to keep her family safe and together. When Mattie's mother contracts the disease, though, she wants Mattie sent away for her own protection. Mattie finds herself fighting for her survival and the survival of those around her. Anderson's historical fiction tale was a pleasure to read. Although the topic is certainly grim, I appreciated the way she created a character as realistic as Mattie to explore it for us. The environment, with people terrified to be near anyone who might have yellow fear, was well-described. A great look at a dark time in American history.